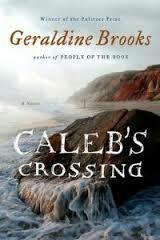 There is no need to add to the accolades already published for Geraldine Brook’s 2011 novel Caleb’s Crossing. While technically not a historical novel it comes very close by adding disciplined imagination to a factual story line that makes this book a great read. I join The New York Time’s Bill Cunningham in his thinking that the prodigious use of the word marvelous is often joyously appropriate. It certainly applies to Caleb’s Crossing.This work of Pulitzer Prize author Brooks proudly stands alongside her so honored March. While reading Caleb’s Crossing I thought of Anya Seton’s Winthrop Women which was set in the same period and mindset. Anne Hutchinson even makes an appearance. Martha’s Vineyard was a distant place in the 1650s but not removed from the narrowness of Puritan provincialism. Bethia and Caleb, a teenage girl and a native young man. You will fall in love with them both as you travel on their personal journey, guided beautifully by Bethia’s narrative. Whether historical novel or fiction, Caleb’s Crossing is further testament that some independent thinkers who came to America during the Great Migration would ultimately prevail over the rigid and strident Puritans.